One of the treasures of the History Center's collection is the daguerreotype of Rhesa Swinney (1833-1911), daughter of Thomas and Lucy (Taber) Swinney. A note found behind the image in its case bears the date of December 25, 1851, indicating that it was probably a Christmas gift from the daughter to her parents. The identity of the photographer is not known, but it may well have been Archibald McDonald, Fort Wayne's most prolific daguerreian artist who had arrived from Buffalo the year before. The result of this Christmas sitting is one of the most exquisite portraits of the period. There is a sense of immediacy about a daguerreotype. As the author Joan Severa observes, "Besides being the truest glimpse of a moment in the past, it is also a peek into the life and personality of a real person living in a time so different from our own. We experience inescapable emotions when viewing these images. A certain vivid face, looking out at you, with its voice just a breath from speaking, can sometimes stop your heart." (Joan L. Severa, My Likeness Taken: Daguerreian Portraits in America , p. xv). Such it is with the portrait of Rhesa, one of the most beautiful women of her time in Fort Wayne. Her life is a study of both tragedy and resilience, depicted poignantly in this image. As the daughter of a wealthy farmer, Rhesa was petite, well-educated, and enjoyed a home with some of the finest amenities of the time. 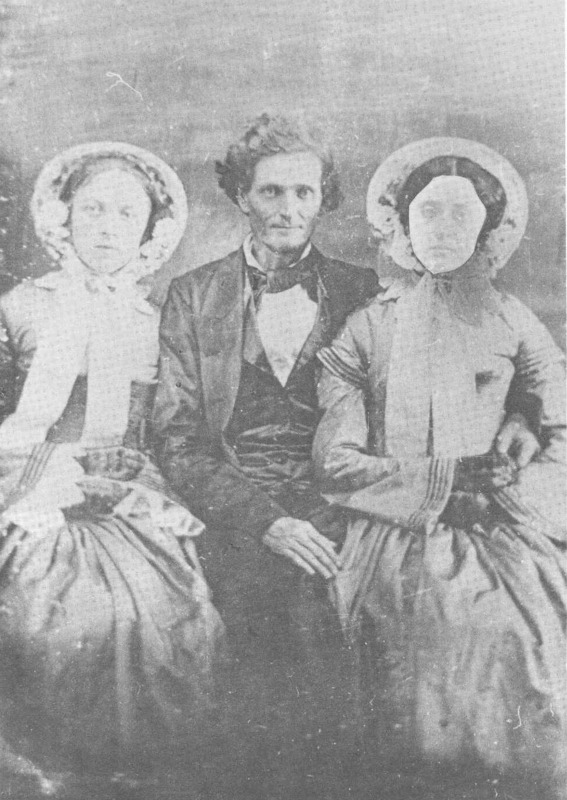 Engaged to be married to J. McNutt Smith, a telegraph operator, she had her heart broken when Smith decided to elope instead at the last minute with her sister, Margaret (1834-1918), on June 27, 1858. Rhesa was so crazed with grief that she pulled out most of her hair, forcing her to wear a wig for the rest of her life. Margaret and her family were never welcomed back into the Swinney home. 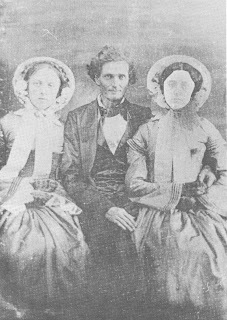 Ironically, just prior to the elopement, Rhesa had posed with Smith and her sister Margaret, with Smith's arm tellingly draped around his future wife. The image was later altered and the face of another sister, Caroline, glued over that of Margaret. Rhesa rebounded after her broken heart. She never married. Instead, showing strength of character, she became the head of her family after her father's death in 1875. She managed the farm, completed construction of a commercial building near the courthouse, and enjoyed playing hostess. On New Year's Day, she presided over large teas with place settings of fine china for more than 100 guests. She was remembered for her "mincing walk, a sort of dancing step with her small feet" as she strode through the city and was unflappable when a gust of wind once blew off her wig. Her father had left the city the grounds that would become Swinney Park, yet it was Rhesa who finalized the agreement with officials in 1893. When she died in 1911, her surviving unmarried sisters said, "The best is none too good for her." She was buried in a casket that cost $1,000, and her funeral was one of the most expensive of the period. In many ways the daguerreotype captures the spirit of the indomitable Rhesa, beautiful and untouchable, who carved for herself an independent life outside the norms of her time. Great article about Rhesa Swinney.